Each time we take a step forward, all of our body weight first rests on the heel of one foot. As our weight moves forward, the entire foot begins to bear the body's weight, and the foot flattens and this places a great deal of pressure and strain on the plantar fascia. There is very little elasticity to the plantar fascia, so as it stretches only slightly; it pulls on its attachment to the heel. If the foot is properly aligned this pull causes no problems. 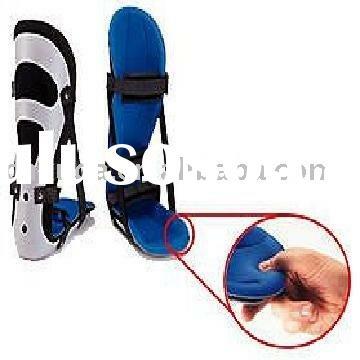 However, if the foot is "pronated" (the foot rolls outward at the ankle, causing a break down of the inner side of the shoe), the arch falls excessively, and this causes an abnormal stretching of the relatively inflexible plantar fascia, which in turn pulls abnormally hard on the heel. The same pathology occurs with "supination" (the rolling inward of the foot, causing a break down of the outer side of the shoe). Supinated feet are relatively in flexible; usually have a high arch, and a short or tight plantar fascia. Thus as weight is transferred from the heel to the remainder of the foot, the tight plantar fascia hardly stretches at all, and pulls with great force on its attachment to the heel. The symptoms of plantar fasciitis include pain in the bottom of your foot, especially at the front or centre of the heel bone, pain that is worse when first rising in the morning (called "first-step pain"), when first standing up after any long period of sitting, or after increased levels of activity especially in non-supportive shoes. Seek medical advice about plantar fasciitis if you have heel pain or pain in the bottom of your foot, especially when you get up in the morning, that does not respond to treatment or if there is redness or bruising in the heel.